You just got a call to go visit prince charming on a last minute get away. 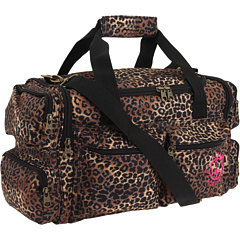 Don’t let the panicked scramble of putting your outfits together overwhelm you when you over abundantly pack using the Billabong® Over My Head Leopard print overnight bag. Large full-zip center duffel compartment. Multiple exterior pockets for stashing all of your overnight essentials.